The sky was pretty clear last night and the evening looked very different than the night before. The sunrise this morning was rather nice. We left the hotel at 9:30 and five miles down the road it was 8:30. The Indian Nation recognizes Day Light Savings time and Arizona does not, so as soon as we were off of the reservation the time change. This could be confusing – am I an hour late or an hour early? Next stop was Cameron Trading Post, a mere 123 miles down the road, which was a good thing. The temperature got up to 38 C (100 F) and I felt like I was getting dehydrated even though I was drinking water. Judith was holding up fine. And as we pulled into the Trading Post parking lot, as we have been seeing a lot of, a group on Harley’s rented from Eagle Riders. Two bikes in the picture are different than the rest. Can you find them? 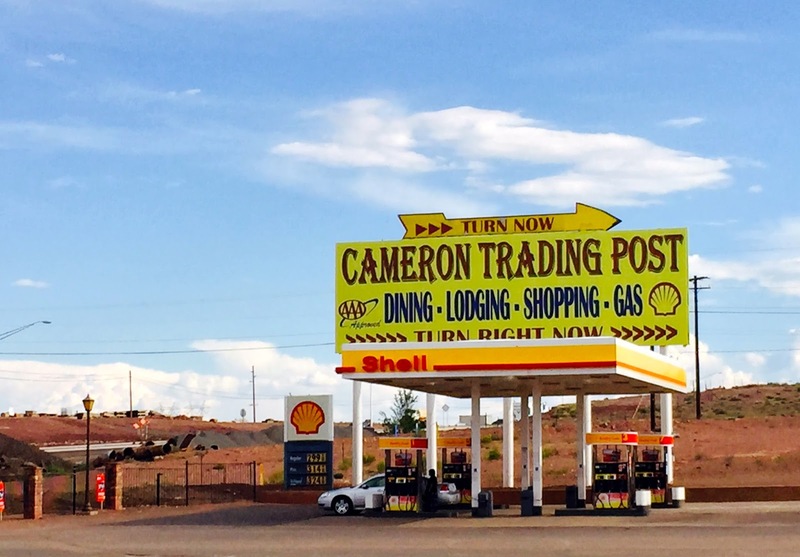 Why is the Cameron Trading Post here in the middle of nowhere? 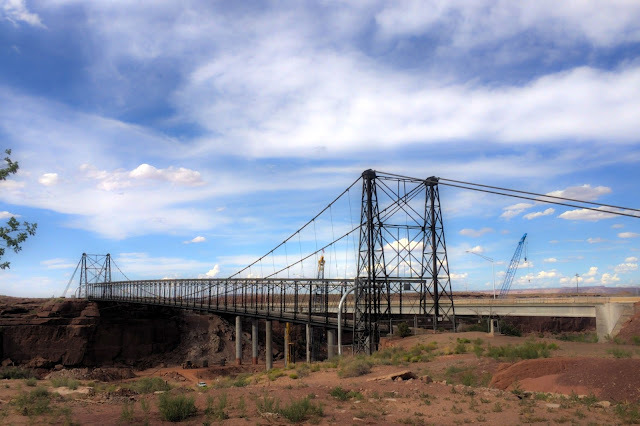 A Swayback Suspension Bridge was erected over the Little Colorado River in 1911 creating the first easy access over the gorge. Soon after, two brothers, Hubert and C.D. Richardson established Cameron Trading Post, visited at that time only by the Navajo & Hopi locals to barter their wool, blankets, & live-stock for dry goods. A trip to the post to trade could take days of travel by horse-drawn wagon. Guests were always treated as family, fed & housed by the trading post during their stay. As traders, the brothers were more than merchants. Understanding local dialects & customs, they were trusted by the local Native American people in matters concerning confusing new American legal & social systems. 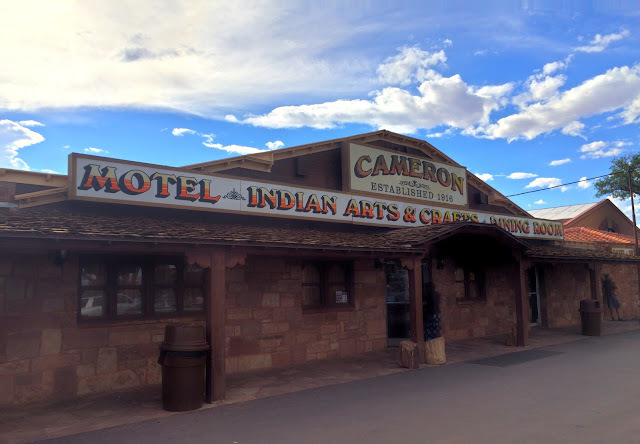 Over time as roads improved & interest in the area grew, The Cameron Trading Post ’s convenience to the Grand Canyon & other intriguing areas made it popular for other travelers as well. Cameron’s philosophy of hospitality accommodated these changes while maintaining its role in the local community. Cameron Trading Post has existed for nearly a century and the people who work here have done so for generations. 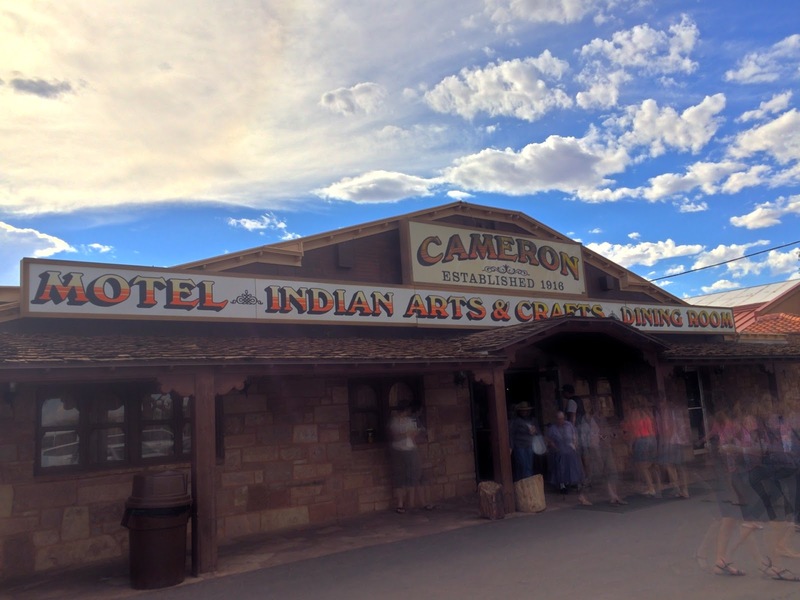 The president of the company is himself descended from the original founders, maintaining the philosophy of hospitality and respect evident in the operation of Cameron Trading Post today. Here is the bridge today. It's been replaced by a concrete bridge. Lots of construction going on. I believe they are adding a second bridge. Not sure how these guys work in 100 degree heat. The place is of course a tourist destination (that’s why we’re here), but the facility is very nice. It’s a throwback to the early years, but not done in a tacky manner. Tomorrow we stop in Flagstaff and I get two new tires. After that we will ride down to Sedona for lunch and then on to Winslow.